Due to weather, classes have been canceled at NYU today. Offices around the university–including Draper–will be closed as well. The MA Thesis Research Workshop scheduled for tonight has been canceled, but will be rescheduled for a date in the near future. We – and most of you – know what a delicious blend of people traverse our proverbial halls here at Draper. We wanted to honor this in writing so we’ve decided to start an ongoing feature of the blog that profiles Draper students and alumni, giving us all a taste of the mix. We set up a dozen questions to ask and we’ll include a brief intro or bio of the profilee. Our inaugural profile is that of Draper alumni, Derek McPhatter. Derek came jumping back to our attention recently with a play of his that was produced by Horse Trade Theater Group as part of a short play festival honoring Black History Month. He was one of seven up-and-coming playwrights to have his work shown and, as you can read below, isn’t stopping there. 1. When did you graduate from Draper? I graduated in January 2006. 2. Did you attend as a full or part-time student? I attended as a full-time student. 3. Do you still live in New York? Yes I do. I live and work in Harlem. 4. What was the topic of your Master’s thesis? With my thesis, I excavated gospel-house music, as a hybridized cultural form. Using ethnographic, historiographic, and structural approaches, I delved into the meanings various communities ascribed to the music. I proceeded with an understanding that gospel house has proven particularly meaningful to black gay communities as a means to express spirituality and sexual diversity. Yet, with the (frequently re-mixed) musical object as the centerpiece, I engaged varied communities with a stake in Gospel House’s significance, from conservative elements of the African American church to international underground dance communities, all of which offered compelling and divergent positions on this unique musical form. 5. Why did you choose to pursue an interdisciplinary degree at Draper? I was invited to consider to Draper after getting a little bit rejected at another NYU Ph.D. Program which we shall not name (and which, in hindsight, would have been the wrong move for me.) After attending the first orientation session for prospective Draper students, I knew it was precisely the type of graduate program I wanted. So when the opportunity presented itself, I did not hesitate. Pursuing a graduate degree was part of my “master plan” towards a successful career as a writer/intellectual superstar. You know, that eccentric, independent author kinda guy. He has dozens of published novels, articles in prominent print (not online) journals. He has critically-acclaimed plays on Broadway that do terribly financially. He has one book of self-obsessed, opaque free verse poetry. He writes introductions to anthologies on various timely topics, routinely praising his peers, most of whom he detests in person. He has independent film options, and guest appearances on TV shows of quality like Charlie Rose on PBS. He provides the occasional guest lecture at universities. And he probably has a yacht. These are among my numerous benchmarks for success. Lately, I’ve been e-blasting Oprah and my boyfriend was quoted in the New York Times a few months ago. So, I think I’m moving right along with all of that. But no yacht. 6. Are you still in academia? Lately, I’ve been making pretty good strides as an early-career dramatic writer, so I’m really focused on about half-a dozen projects in theater and the performing arts. The Ph.D. might be the right move down the road, and I still stay connected to the Academy, as a lot of my friends and colleagues are in that world. 7. What special activities or projects do you enjoy outside of your academic work and/or career? I suppose useless facebook apps eat up a good portion of time I should be using for more productive ends. (Starfleet Commander is my current favorite.) I also watch Bravo and HGTV a lot, and just discovered the “Free On Demand” feature on cable, so now I’m catching up on the BBC’s Doctor Who. But honestly, it’s hard for me to articulate “projects I enjoy outside my academic work and/or career.” My day-job is doing grant writing and resource development for the Apollo Theater. That’s time consuming work, but well worth it as a behind-the-scenes experience on how a cultural institution functions and evolves. And beyond that daily grind, in my free time I’m doing stuff to further my individual career – writing plays, filing out fellowship and grant applications, trying to network. And even stuff I do for fun (like sci-fi frivolity) has a thematic impact on some of my more creative stuff. Oh yeah, cocktails. I like cocktails, but that falls under “networking” right? And that’s work. 8. What do you like best about New York City? New York City has such a broad palette of things to do. Arts and Culture in the Big Apple is alive and well, though “breaking in” is a challenge (an NYU degree goes a long way here.) I could fill my calendar with fun things to do every night of the week if I wanted to. 9. What do you like least about New York City? 10. What was the last book you read for fun? I finished Octavia Butler’s Mind of My Mind in January. It’s the second book in her Patternmaster Series, which is the one series of hers I’ve never finished. (As I am a budding sci-fi writer of color, Octavia Butler is one of my idols.) Her work is always engrossing and often makes me a little bit uncomfortable, so I switched things up for February. I’m twenty two pages into William Burroughs’ Naked Lunch. 11. If you could change anything about ______ [fill in the blank: New York City, the world, the economy, your hair…] what would it be and why? 12. How do you feel about social media and which, if any, do you use most? I log on to Facebook regularly. Even when I’m not on the Starfleet Commander app, building my intergalactic armada, I’m checking in with long lost friends, family and such. As a playwright/producer, I use the Facebook events feature often to get the word out. (I also check my event RSVP’s compulsively.) If I don’t get a handle on my Facebook addiction soon, I might need to go on INTERVENTION. But I don’t tweet. Nope. Not into that tweeting. Tweeting is for “tweens” and other auspiciously marketing-driven consumer segments that don’t really apply to me. Myspace used to be fun, but I forgot my password on purpose. I do some gay-themed social networking sites sometimes, but that’s really just for eye-candy these days. Online dating has led to serious romance for me, so I’m all for logging-in for love and life. 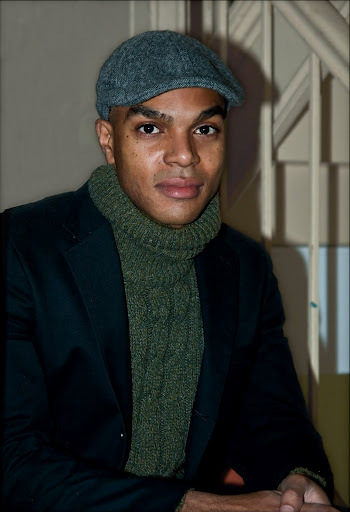 Derek Lee McPhatter (Playwright) Originally from Pickerington Ohio, Derek has lived in Atlanta and Osaka, Japan and calls Harlem home. His most recent play, Citizen Jane, was featured in the Horse Trade Theater Group’s Fire This Time Festival in February 2010. Derek was a 2009 resident playwright with Freedom Train Productions, developing a new music-theatre dramedy: Bring the Beat Back. He is the development director for Under the Spell Productions, and co-author of the company’s signature show, It Goes Unsaid, which has been produced at Harlem’s Poets Den, the University of California, and London’s Institute of Contemporary Arts. Derek was a finalist for the New York Theatre Workshop’s Emerging Playwright’s of Color Fellowship in 2007. He has publications in the journals Anamesa, Flash Fantastic, and the Encyclopedia of African American Culture and History. He is a member of the Harlem Arts Alliance and the Speculative Literature Foundation and holds degrees from Morehouse College and NYU, where he completed his master’s thesis—Let the Kids Say Amen: Black Gay Spaces and the Hybridity of Gospel House Music. By days, Derek works at the Apollo Theater and hosts the Apollo Salon Series, a works-in-development program presented weekends in April. He invites you to check out his blog: http://www.itsdmcp.blogspot.com for more. Judith Butler is a Professor in the Departments of Rhetoric and Comparative Literature at the University of California, Berkeley. She received her Ph.D. in Philosophy from Yale University in 1984. She is the author of several books, including Gender Trouble, Bodies that Matter, The Psychic Life of Power, Antigone’s Claim, Precarious Life, and Undoing Gender. Her most recent book, Giving an Account of Oneself, appeared with Fordham University Press (2005) and considers the relation between subject formation and ethical obligation, situating ethics in relation to critique and social theory. Event organized by Comp Lit undergrads the inaugural annual Majors’ Choice Lecture Series. Sponsored by the NYU Department of Comparative Literature and the CAS Dean’s office. Why not use Spring Break to “clean up” your research and organizational skills? Some of the sessions are one-hour sessions on a single topic, while others are designed to give you a chance to get help with whatever questions you might have. All sessions are led by expert librarians, and take place in the Bobst Library computer labs on Lower Level 1. Classes are scheduled twice a day, every day, with early evening sessions for those coming from work or other engagements. So you can’t go somewhere fun in the sun for Spring Break; you can still make the rest of your semester a little less stressful and a little easier. This workshop is primarily intended for students who are in the early phases of thesis preparation, but also for those at later stages of the process. Students will receive guidance on how to refine their topics and narrow the scope of their theses, and on some of the basic mechanics of writing up their work. Please RSVP–call 212.998.8070 or email draper.program@nyu.edu to let us know if you’ll be attending.